Abstract. The mid-Piacenzian is known as a period of relative warmth when compared to the present day. 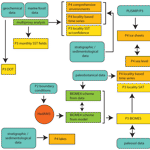 A comprehensive understanding of conditions during the Piacenzian serves as both a conceptual model and a source for boundary conditions as well as means of verification of global climate model experiments. In this paper we present the PRISM4 reconstruction, a paleoenvironmental reconstruction of the mid-Piacenzian ( ∼ 3Ma) containing data for paleogeography, land and sea ice, sea-surface temperature, vegetation, soils, and lakes. Our retrodicted paleogeography takes into account glacial isostatic adjustments and changes in dynamic topography. Soils and lakes, both significant as land surface features, are introduced to the PRISM reconstruction for the first time. Sea-surface temperature and vegetation reconstructions are unchanged but now have confidence assessments. 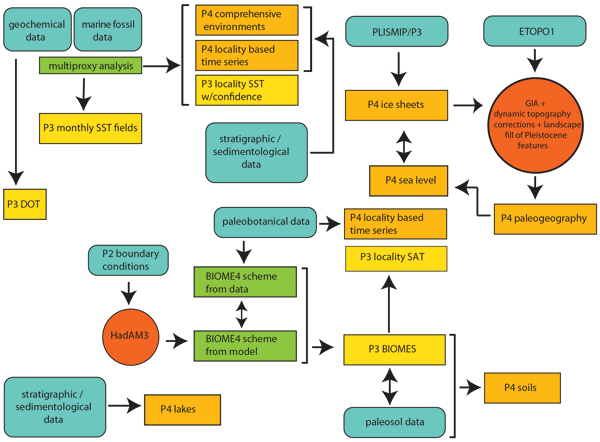 The PRISM4 reconstruction is being used as boundary condition data for the Pliocene Model Intercomparison Project Phase 2 (PlioMIP2) experiments. How to cite: Dowsett, H., Dolan, A., Rowley, D., Moucha, R., Forte, A. M., Mitrovica, J. X., Pound, M., Salzmann, U., Robinson, M., Chandler, M., Foley, K., and Haywood, A.: The PRISM4 (mid-Piacenzian) paleoenvironmental reconstruction, Clim. Past, 12, 1519-1538, https://doi.org/10.5194/cp-12-1519-2016, 2016.